At Sunnyside Dental, we see a lot of mature patients who are looking for an orthodontic solution that won’t disrupt their busy lives. We offer Invisalign because it fits every lifestyle and timeline. But…braces are for teenagers! Why would adults turn to treatment? Cosmetics – There may be something in your smile that has always bothered you; now, you’re ready to do something about it! Bite Improvement – Even minor changes within your mouth can shift your teeth over time. Sometimes, patients who used to have perfect teeth or who had braces as teenagers find their smiles have changed. Pain Relief – A misaligned mouth can cause long-term pain, sensitive gums, and eventually even tooth loss. Invisalign can re-adjust your bite so that everything works the way it’s supposed to –it can be a successful remedy for oral pain, and a strong preventative measure for future oral health issues. Flexibility – There are moments when professionals simply cannot have a dental apparatus in their mouths. The Invisalign trays are removable (for limited amounts of time each day), so that eating, brushing teeth, or, even giving an important presentation can be done easily. Timeline – With an average treatment time of 18 months (cases may vary), and options for accelerating the process, Invisalign can lead to results a lot sooner than old-fashioned orthodontic treatments. We have a lot of patients who look into the option of invisible aligners when their own children are ready for orthodontic treatment. We’ve heard from countless parents who forgot to wear their retainers after their own experience with braces as teenagers. Some patients simply never had the opportunity to straighten their teeth when they were young, but are ready and able to do so, now. But busy, working adults can’t leave work for regular visits to the orthodontist! Running a household doesn’t leave a lot of time for painstakingly cleaning around wires after every meal. Working professionals don’t want a mouthful of metal to distract from an important client meeting! 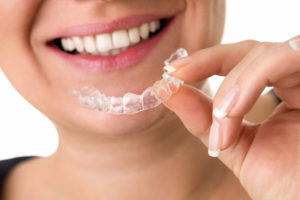 Invisalign is the perfect answer to all of these “grown-up” issues. Seniors often come into our Kelowna office for Invisalign treatment, as well. Straight teeth may be something they’ve always wanted, but they assume that they’ve long “missed the window” for effective treatment. Not true! With modern, computer-driven technology like Invisalign and Sunnyside’s new iTero scanner, any patient with healthy teeth and good bone density can have successful results. Here in the Okanagan, we laugh at the idea of being “too old” for anything! This is a community of vibrant, active people of every age. 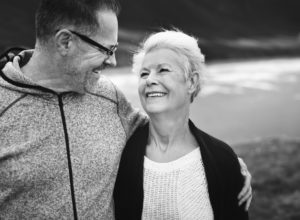 Our older clients don’t want to be limited in their retirement activities by being tied down to orthodontist appointments, or having to fuss with the waxes, rubber bands, and tiny brushes that are all part of the maintenance of traditional orthodontia. These patients are looking for something easy. Discrete, non-invasive, and gentle, Invisalign helps make every activity more enjoyable! So…Invisalign is the right answer. Traditional braces still serve a purpose, but we’ve found that our adult patients are usually excellent candidates for the Invisalign alternative. The removable, transparent trays appeal to those who want their dental correction to be as unobtrusive as possible. The precision design of the system is a perfect fit, ensuring minimal discomfort. And, because the adjustment is gradual and finite, the whole Invisalign treatment process takes less time than traditional braces would. With so many benefits, Invisalign can help patients of any age flash a much happier, prettier smile! The dental team at Kelowna’s Sunnyside Dental is ready to help you get the straight teeth you’ve always longed for! Contact us to book your free Invisalign consultation, today!